The Alcatel OneTouch Net features a dedicated button for access to Yahoo's homepage, as well as a suite of Yahoo services. Yahoo! Mail, Voice Search, Messenger, Social Pulse, and above all, Flickr are all there to satisfy your inner Yahoo. Tata DOCOMO has bundled its own carrier apps, and there is a separate button leading to its "Dive In" portal, too. Talk about a cooperative effort here - a French manufacturer is making a phone for a joint venture of a Japanese carrier and an Indian conglomerate, to ease access to the services of an American web portal in India. 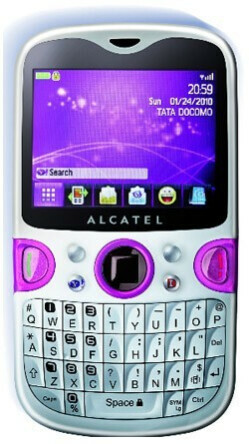 Globalization is here to stay, it seems, and you can have the Alcatel OneTouch Net for Rs. 5,499 ($120). Tata DOCOMO has the phone on prepaid plans, as well as on contract, but if you sign up for postpaid, they are throwing in a Reebok watch totally free. How cool is that now? If Facebook can have its own phone, so can Yahoo.